Our award-winning hosted VoIP softswitch and billing platform is a reliable, cost-effective Class 4 and Class 5 solution for VoIP providers. With Telinta, you and your resellers can offer a full range of white label VoIP services, without investing in your own infrastructure. TeliCore™ is our carrier-grade hosted VoIP softswitch platform, integrating Telinta’s cutting-edge VolP solutions with world-class Switching and Billing capabilities. Our Class 4 softswitch capabilities offer a carrier-grade hosted solution for Wholesale VoIP providers. Our Class 5 softswitch capabilities are perfect for end-user services such as Hosted PBX, Residential VoIP, Mobile solutions and more. Through APIs integrated into our platform, you can easily access your accounts with DID providers, mobile top-up providers and other complementary services. With daily offsite backups, redundant infrastructure and rigorous security, Telinta’s hosted Class 4 and Class 5 softswitch and billing platform is trusted by VoIP service providers around the world. The above diagram shows how TeliCore provides the foundation for you to build and operate a profitable telecom business. You can easily access TeliCore via your web browser to configure the services you offer to your customers and your resellers. Your DID providers offer phone numbers for your home country, or worldwide. They enable you to handle calls coming from the PSTN. Your A-Z termination providers carry calls back to the PSTN, where they are carried to their final destination virtually anywhere in the world. TeliCore provides the intelligence to handle quick and efficient routing, rating and reporting for your traffic. TeliCore offers a single hosted platform that enables you to bring together the many pieces needed to run your business, without owning or operating your own infrastructure. 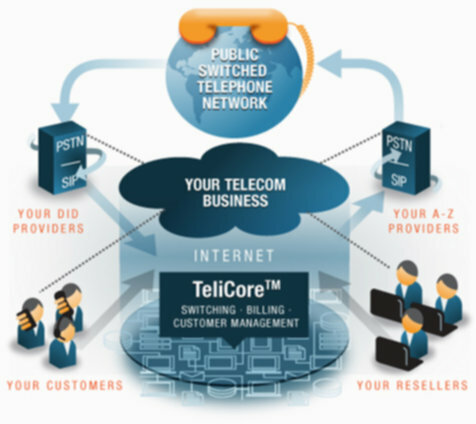 TeliCoreTM is our hosted VoIP softswitch and billing platform. TeliCore is a carrier-grade solution, complete with the features you need for hosted switching, billing and customer management. Whether your business is large and established, or small and growing, Telinta offers the hosted VoIP softswitch and billing platform features that can help you succeed. Our platform enables you to provide a variety of billing and payment options to your customers for both Prepaid and Postpaid VoIP services, volume discounts and more. Our hosted VoIP softswitch and billing platform brings you the benefits of having an industry leading softswitch and billing platform without capital investment, maintenance costs or deployment delays. TeliCore™ is our carrier-grade platform that lets you offer a full portfolio of profitable VoIP services. Your company will benefit from over a decade of Telinta’s experience in helping our customers to grow. Telinta offers you the benefits of a hosted VoIP softswitch and billing platform, without having to invest in your own infrastructure. With Telinta, you can manage your VoIP business through the cloud using your own web browser and internet connection. With Telinta, you can build your business quickly and easily. When you become a Telinta customer, your hosted VoIP softswitch solution can be up and running in as little as three days! Your per minute costs are reduced significantly as your VoIP traffic volume increase. Your company benefits by having predictable costs, making it easy to plan your monthly operating budget. One key benefit of working with Telinta is that our success is based on your success. When you grow, we grow with you. 24 x 7 x 365 live technical support. Our highly-trained engineers have unparalleled expertise in helping you with technical issues regarding our hosted VoIP softswitch and billing platform. Telinta is available around the clock to answer your questions or help you configure your services. TeliCore™ enables you to use any provider you need for VoIP termination, origination (DIDs) and other key services. Our flexible routing lets you use as many providers as you need. This gives you the benefits of selecting as many providers as you need to balance both cost and quality.